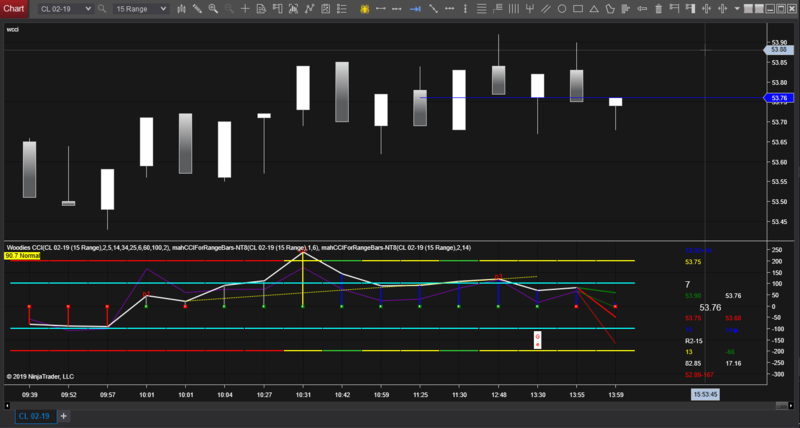 This is a conversion of the NinjaTrader 7 CCI4RnageBars indicator by snaphook on NinjaTrader Forum. - Warning: If a BarStyleType other than Range Bars is used the results are not valid and the following warning message will be printed "Warning: This indicator works with Range Bars only." - Added lines for 200, 100, 0, -100, -200 CCI levels so that the indicator can be used independently. If superimposed on other CCI indicators, their line brush can be set to Transparent. Application: This indicator predicts the future CCI values at the projected High and Low of the current developing Range Bar. This is useful for trade entries, target, and stops based on CCI value. For example, if a strategy calls for entering or exiting a trade once CCI crosses a certain CCI level, one can see early the projected CCI high and low values at the completion of the current bar and make early trade decisions before the bar completion. The CCI for Range Bars plots the CCI and splits the last plot into a high line and a low line showing what the CCI will actually look like at those close positions. It only works for Range Bars. Traders can turn off the CCI and Turbo line Colors (transparent) and add this indicator twice to the WCCI Panel, one for CCI and one for Turbo, and set the colors and widths. The plots will exactly replicate the plots on Woodies except you will now have a very accurate depiction of the future CCI. Importing to NinjaTrader 8 is Easy!